Have a happy and safe Holiday Season! Clink on images above for more videos, safety tips, and other learning materials & activities! •	If you have an artificial tree, be sure it’s labeled, certified or identified by the manufacturer as fire-retardant. •	If you choose a fresh tree, make sure the green needles don’t fall off when touched; before placing it in the stand, cut 2” from the base of the trunk. Add water to the tree stand, and be sure to water it daily. 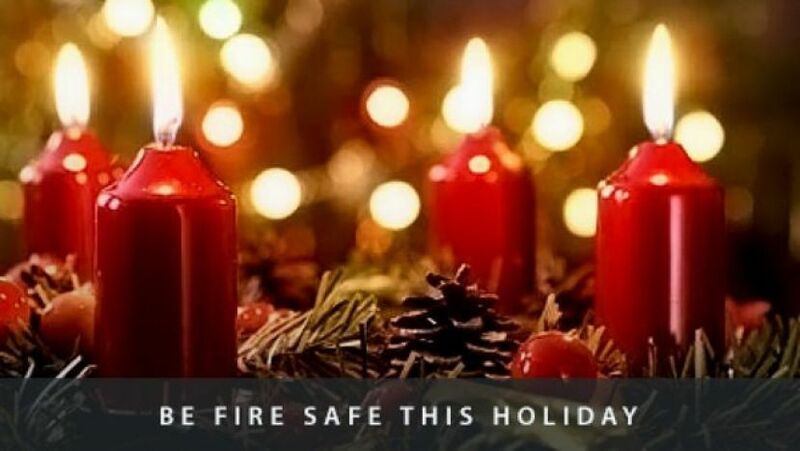 •	Make sure the tree is not blocking an exit, and is at least three feet away from any heat source, like fireplaces, space heaters, radiators, candles and heat vents or lights. •	Use lights that have the label of a recognized testing laboratory, and make sure you know whether they are designed for indoor or outdoor use. •	Replace any string of lights with worn or broken cords, or loose bulb connections. Read manufacturer’s instructions for number of light strands to connect. •	Always turn off Christmas tree lights before leaving the home or going to bed. •	After Christmas, get rid of the tree. Dried-out trees are a fire hazard and should not be left in the home or garage, or placed outside the home. Electrical distribution or lighting equipment was involved in two out of every five (40%) home Christmas tree fires. More than one-third (37%) of home Christmas tree fires started in the living room, family room, or den. All of the fatalities and roughly three-quarters (72%) of the injuries resulted from fires started in this area. The top three days for home candle fires were Christmas, New Year’s Day and New Year's Eve. -Stay in the kitchen when you are cooking on the stovetop so you can keep an eye on the food. -Stay in the home when cooking your turkey and check on it frequently. -Keep children away from the stove. The stove will be hot and kids should stay 3 feet away. -Make sure kids stay away from hot food and liquids. The steam or splash from vegetables, gravy or coffee could cause serious burns. -Keep the floor clear so you don’t trip over kids, toys, pocketbooks or bags. -Keep knives out of the reach of children. -Be sure electric cords from an electric knife, coffee maker, plate warmer or mixer are not dangling off the counter within easy reach of a child. -Keep matches and utility lighters out of the reach of children — up high in a locked cabinet. -Never leave children alone in room with a lit candle. -Make sure your smoke alarms are working. Test them by pushing the test button.